You know the old saying, “it’s not about the destination, it’s the journey”? We believe that’s only partially true. Especially in a town like Denver, we know you have tons of exciting destinations on your itinerary. That’s why we’re here to make the journey as comfortable and smooth as possible. Denver Charter Bus Company is your top provider for simplified charter bus and minibus transportation throughout the Mile High City. Don’t believe us? Just ask any of our satisfied customers, from big-name clients like Facebook and the NFL who rely on us for professional and efficient transportation, to the families, friends, and communities who count on us to make their Denver travels that much more memorable. Whether you’re traveling with a small group or an extensive caravan, for business or for pleasure, our expert reservation team works non-stop to find the best motorcoach for any occasion. 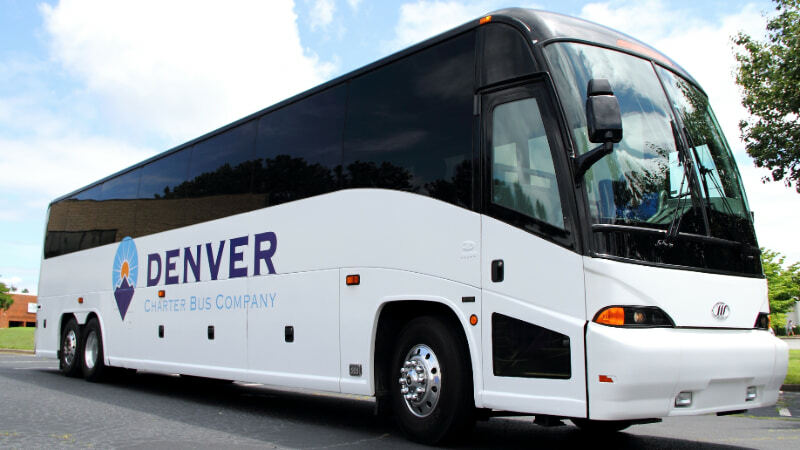 Book your transportation with Denver Charter Bus Company, you’ll have your choice of any of the vehicles in our vast network of buses. From compact 18-passenger minibuses to full-sized 56-seater charter buses, we can service short trips and long hauls alike, no matter how many passengers you have in mind. Looking for a combination of transportation services? We can craft the ideal, custom fleet to fit your headcount, schedule, and number of stops. Beyond make and model, you can count on our reservation team to find a motorcoach with the best array of amenities to suit your needs. Whether you’re looking to keep your passengers entertained en route with televisions, WiFi, and auxiliary ports, or you’re in need of ADA-accessible accommodations or an on-board restroom, we’ve got you covered. Ditch the traditional yellow school bus and book a private transportation service for all your field trips and academic events! A personalized charter bus or minibus service ensures your passengers, big and small, arrive together and on time. From important meetings with potential clients and partners, to company getaways and team-building events for your employees, streamline your professional passengers’ transportation with a sleek and efficient corporate shuttle service. No matter who you cheer for, your athletes, coaches, and spectators can benefit from pre-planned sporting event transportation. We’ll take the stress of securing a ride off your plate, so your passengers can focus on finessing their game face. Planning your dream wedding in the Mile High City? From simple ceremonies, to extravagant receptions, to unique wedding showers, parties, and dinners, we’ll handle your loved one’s transportation so they can focus on you and your partner on your special day. When it comes to visiting loved ones, planning church outings, or organizing youth group events, the last thing you should have to worry about is reliable transportation. Save everyone the hassle of coordinating carpools and rideshares by booking a private Denver shuttle! How do we do it? Easy: our network grants us — and by extension, you— access to the best professionals and experts in the industry. From stellar customer service to flawless roadside manner, every step of the rental process is fine-tuned to ensure you have the best travel experience possible. Need help finding and securing your perfect ride? Our reservation team is available around the clock to take your call at 303-495-2341. Whether you’d like a walkthrough of the rental process, assistance making changes to your itinerary, or a personalized, no-obligation quote, we’re always here with a friendly representative and a dedication to making your next Denver trip memorable and easy. with extensive background checks, rigorous performance exams, and a long list of certifications as a testament to their skills. with years of training, a variety of top-of-the-line motorcoaches at their fingertips, and the care of every passenger in mind. with a habit of showing up at least 15 minutes early to each destination and punctuality as a core value, ensuring your transportation runs like clockwork. When these professionals take the wheel of your custom-curated charter bus, you can rest assured your Denver travels will be well-managed and stress-free, from reservation to final destination. From quick trips down Market Street to day trips beyond the Rockies, let Denver Charter Bus Company take you there. We can get you a bus in as little as 2 hours, so there’s nothing holding you back from the Denver adventure of your dreams! Call us today at 303-495-2341 to get started.